That’s obviously not the reaction you want your customers to have, but a lot of small companies still skimp on the customer service end, focusing instead on building and improving the product. Plus, the cost of hiring someone who is solely in charge of responding to every little whim of the customer may be prohibitive for a company that’s just getting its feet on the ground. That, however, has just changed. Brace yourself, kids, because the future is here and it’s called viClone. viCloning is the latest from Viclone, a up-and-coming major player in the virtual assistant world. Before you write this off as just another automated response (“For first name, press one. For last name, press two. For address, press three. To blow up your phone out of frustration, press four.”), check out what makes viCloning even better than ASIMO. This part makes me seriously jealous. 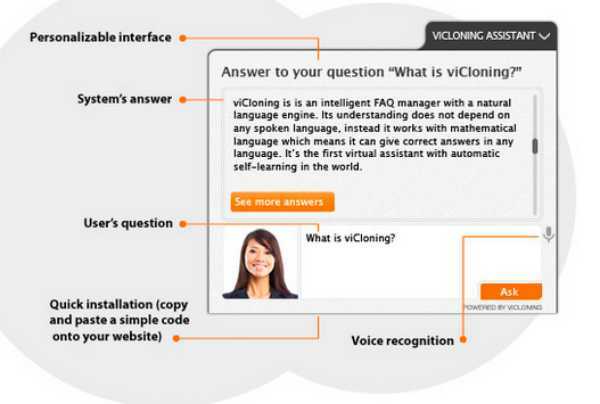 (Weird, I never thought I’d find a time in my life when I was jealous of artificial intelligence…) viClone uses mathematical language, which means it can respond to your customer’s question in whatever language is being used. Well, maybe not any language. Currently this badass robot polyglot can respond in Spanish, English, Catalan, Russian, French, Italian, Portuguese and German, but they’ve got 45 more languages coming up, so I think you’re probably covered. viClone costs about as much as you’d pay for a live chat customer service option, but consider this: viClone doesn’t need vacations, won’t take sick days, and you don’t have to pay for benefits. Even if you’re doing everything all on your own, the reality is that splitting your time between multiple tasks has its own cost as well: your time. Do the calculations. How much is your time worth? I’m gonna bet you can afford to spend a little money to get back a little time. This reliable little worker only takes five minutes to set up and then you can pretty much wipe your hands of any other maintenance. ViClone doesn’t require any tech skills on your part because it’s one of the first self-managed virtual assistants out there. Hopefully you’re already keeping track of the questions customers throw your way, but that’s definitely a lot of work and another one of those things that tends to pushed to the back burner when more pressing issues pop up. The thing is, the questions your customers are asking are invaluable for your development, they’re your front lines and they’re the ones who can let you know what’s right, what’s wrong, and what definitely needs to change. viClone offers you real-time analysis that you can use then and there, rather than having to spend hours sifting and sorting through data. I think viClone sounds like an amazing tool for any startup. Even if this list of excellent reasons doesn’t have you sold, consider this: how badass would it be to tell everyone you have an AI customer service rep?